I suppose I had better start this piece with a spoiler alert. If you have not seen the documentary entitled ‘Treasures from the Wreck of the Unbelievable’ then go to Netflix and watch it. 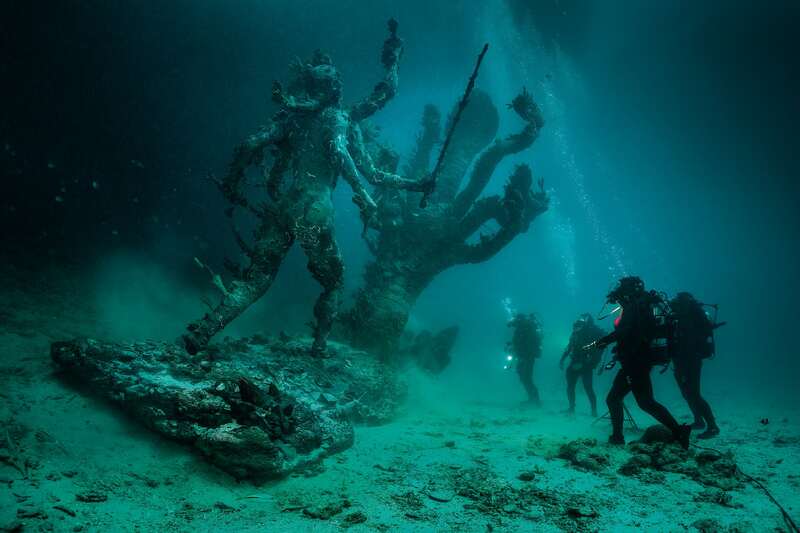 For those who are familiar with the exhibition held in 2017 in Venice by Damien Hirst and the documentary about the discovery of the treasures, please read on. The exhibition contains 170 works of art made by Damien Hirst and his assistants. Nearly 100 of them are fashioned to look like objects or statues, or parts of the remains of statues, from the distant past, encrusted with coral and shellfish as though they have been underwater for a long period. The rest are replicas or representations of the same pieces. A more devious person than Damien Hirst might have made these sculptures for the purpose of passing them off as real antiquities and making a fortune by selling them, hoping no one discovered them to be fakes. However Hirst understands that there is a tenuous position available to an artist which is neither that of being the author of original ‘cutting edge’ work, nor the producer of fakes: it is to be the author of works of art informed by a fictional narrative. Hirst’s previous works include butterflies, centrifugal paintings, a diamond encrusted skull, coloured dots and pills, and pickled sharks and cows. All have narratives which are nonfictional and do not require an engagement with make-believe in order to enjoy and understand them. What you see is simply the communication of ideas via light, space, form and colour. The Treasures however cannot be fully appreciated without engaging in make-believe, whether you begin by believing they are ‘real’ and then discover that they are fictional, or whether you first approach them knowing that they are works of Hirst and his assistants. It would be easy to dismiss this as less worthy than the challenges of nonfiction art, and to deprecate the work as being less ‘serious’. It was quite clear reading reviews of the Venice exhibition that some critics cannot overcome the prejudice, inherited from the Modern movement, that fictional narratives are a silly distraction from the noble goal of pursuing artistic ‘truth’. (1-3) As Henry Moore’s daughter Mary put it ‘Damien Hirst has set art back 100 years’, after her father had freed it from context and narrative. (4) But for those of us who have escaped the clutches of such orthodoxy, there is no sense that narrative in general, and fictional narrative in particular, belongs any more to the past than the present and future. A moment spent contemplating the continued success of the forms of the novel and television drama should put this into perspective. As an architect championing the use of fiction narrative in the design of buildings, I am overwhelmed and delighted by what Damien Hirst has achieved in the field of sculpture by this body of work. The links below reveal the visual splendour of the exhibition and much interesting background.